Eggplants belong to the nightshade family of vegetables, which also includes tomatoes, sweet peppers and potatoes. They grow on a vine similar to tomatoes. They are a glossy deep purple color and are in season from August through October. There are many different varieties. The varieties differ in taste but generally they have a spongy texture with a pleasantly bitter taste. Eggplant is a very good source of dietary fiber, vitamin B1, and copper. It is a good source of manganese, vitamin B6, niacin, potassium, folate and vitamin K. One cup of cooked eggplant has 35 calories. Eggplant can be baked, roasted in the oven or steamed. It can be used in sandwiches, salads, vegetable dips, and pasta dishes. Brush about 2 Tbsp olive oil onto eggplant slices; arrange in a single layer in a shallow baking dish. Bake in the preheated oven until eggplant is tender and browned, 20-25 minutes. Remove eggplant from oven and reduce temperature to 350 degrees F.
Heat 1 Tbsp olive oil in a large skillet or frying pan over medium heat; cook and stir onion, mushrooms, and garlic until onion is softened, 5-10 minutes. Add tomato sauce, basil, and oregano; bring to a boil. Reduce heat and simmer until sauce is slightly reduced, about 10 minutes; season with salt and pepper. Arrange about ½ the eggplant slices in a 2 quart casserole dish; top with ½ the sauce, ½ the mozzarella cheese, and ½ the Parmesan cheese. Repeat layering with the remaining ingredients. Bake in the preheated oven until hot and bubbling, about 25 minutes. Cool for about 5 minutes before serving. This was delicious if you like eggplant parmesan! 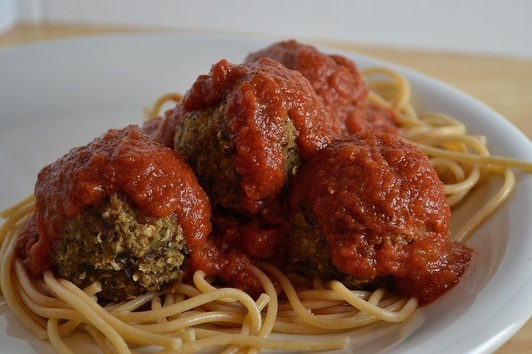 You could substitute a 15 oz jar of your favorite prepared marinara sauce instead of the plain tomato sauce. Preheat oven to 400 degrees F. In a large bowl, toss the cubed eggplant with olive oil and salt and pepper. Arrange the eggplant in a single layer on a large baking sheet. Roast about 25 minutes. In a large bowl, toss the tomatoes, zucchini, onion, olive oil, salt and pepper. Arrange on a small baking sheet. Roast about 12 minutes. Bring a pot of salted water to boil. Add the orzo, and cook about 9 minutes. Drain and transfer to a large bowl. Dressing: Whisk together olive oil, lemon juice, garlic, salt, red pepper flakes and ground black pepper. 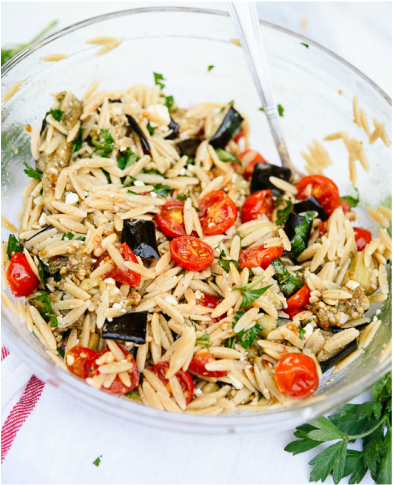 Drizzle it over the warm orzo and toss to coat. Add the roasted eggplant, tomatoes, zucchini, onions, feta, basil, parsley and pine nuts. Toss to combine. Serve immediately. My family loved this dish!! 1. Line a baking sheet with aluminum foil and grease with olive oil. Place eggplant halves, cut sides down, onto the baking sheet. Pierce skin of eggplant several times with a fork. Roast in heated oven 30-40 minutes or until soft. Side aside and cool. 2. Scoop flesh from eggplant halves onto a cutting board, chop into small pieces and put into a large mixing bowl. 3. Mix the crumbles, carrot, onion, cheese, egg, garlic, spices, salt, pepper and breadcrumbs/flour and gently mix together. 4. Make into size of meatballs desired. Reduce oven to 350 degrees and bake meatballs for about 10 minutes, turn and bake another 10 minutes. Or the meatballs can be fried in olive oil in a fry pan. Preheat oven to 350 degrees F - grease a baking sheet. 2. Heat olive oil in skillet over medium heat; cook and stir onion and garlic until tender (5-10 minutes). Add eggplant, spices, salt and pepper; cook and stir, mashing occasionally with a wooden spoon, until eggplant is cooked (about 10 minutes). Remove skillet from heat and cool to room temperature. 3. Add egg, cheese and bread crumbs to mixture. Refrigerate mixture for 15 minutes, then roll into balls or form into patties. 4. Place eggplant balls on prepared baking sheet. Bake in preheated oven for 30 minutes. Serve with favorite sauce and pasta. The patties could be fried in olive oil in a fry pan if desired. In a dutch oven or large fry pan place sweet potato, eggplant, peppers, carrots, onion and three tablespoons oil. Saute over medium heat for about 10 minutes. Pour garlic and spice mixture into the fry pan with the vegetables in it. 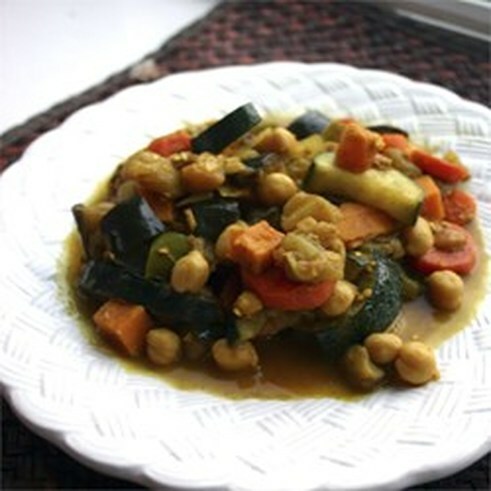 Add the garbanzo beans, almonds, zucchini, raisins and orange juice. Simmer 20-30 minutes, covered. Add spinach to the pot and cook for 5 more minutes. This could all be placed in a large 2 qt pyrex bowl and placed in the over for a few minutes prior to serving.